Un consortium allemand investit dans le rail en Russie - Infrastructure France, le think tank de la mobilité et de la prospérité. « Germany’s Initiative Group wants to provide up to ‎€2 billion to finance the Moscow-Kazan high-speed railway, according to the Vice President of Russian Railways (RZD) Aleksandr Misharin. "We have a proposal from our German colleagues on signing a similar [Russia-China – Ed.] memorandum on cooperation, where they make commitments on financing of up to €2 billion in the project on various conditions,” Misharin told reporters on Friday. He added that Russia hasn’t signed the memorandum yet and that funds from foreign investors might be required for the project next year. Beijing has already expressed an interest in funding the ambitious project, saying it will put up $6 billion. Joint Russia-China investment in the railway averages $15 billion. The total cost of the 770-kilometer Moscow-Kazan link is estimated at $21.4 billion. It is expected to reduce the travel time between Moscow and Kazan, the capital of the Republic of Tatarstan, from 14 hours to just three and half hours. 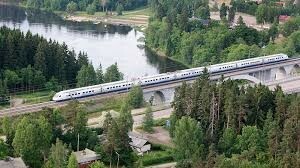 The train will be able to reach speeds of 400 kilometers per hour.